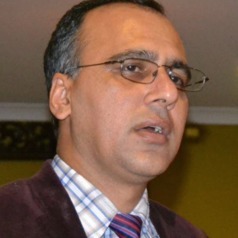 Dr. Bharat Raj Poudel is a professional 'media and disaster expert' with specialisation in various realms namely disaster management, social dimension of disasters, disaster preparedness and its prevention, media framing of disaster events, crisis and risk communication, news and current affairs, political, economic and cultural aspects of community and social development. He has been associated with international agencies like UNDP, Nepal Centre for Disaster Management (NCDM), Nepal Academy of Science and Technology (NAST), Radio Sagarmatha, Radio Skid Row (Himalayan Nepalese Show), www.southasia.com.au and Nepali Times Australia. Dr. Poudel is a PhD graduate from Queensland University of Technology (QUT), Brisbane, Australia. His research title was “Developing a disaster management model for news production in Nepal: A study on Nepalese media portrayal of disaster events using news frames and PPRR cycle of disaster management”. He is currently a Managing Editor at Nepali Times Australia (NTA), Editor-at-Large at http://southasia.com.au/ and Producer at Himalayan Nepalese Program at Radio Skid Row 88.9 Marrickville,NSW. Dr. Poudel was awarded a Dean’s Commendation on excellent academic achievement in Master of Community Development-MCD (2009) from Southern Cross University (SCU), Australia. He had his first Masters Degree MA (2002) and Bachelor of Plant Science-BSc (2000) from T.U, Kathmandu, Nepal. He received Nepal Press Institute fellowship awarded by Nepal Academy of Science and Technology (NAST) in 1997 and honoured as Community Radio Journalist by some organizations in Australia and Nepal. He received several fellowships and Grant in Aid assistance from various institutions in Nepal and Australia. He has been a regular contributor to various magazines and panellist for the media in Nepal and Australia.